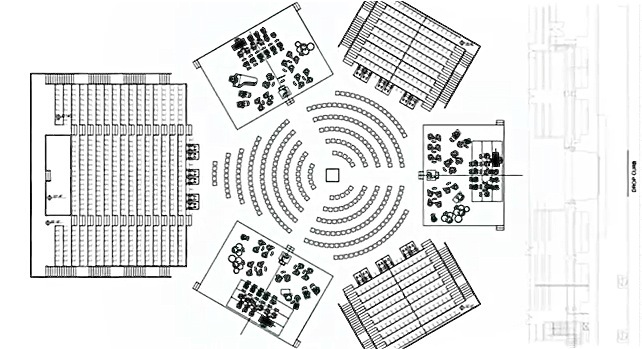 A performance of Stockhausen's spatial masterpiece. To tide you over, we are proud to present this Youtube video of Stockhausen's Gruppen, featured in the concerts. This unique work is written for three separate orchestras with three conductors and the audience in the middle. The Philharmonic pays homage to Henri Dutilleux. On Tuesday night, the New York Philharmonic presented a special one-off concert celebrating the music of Henri Dutilleux, the 96-year old French composer who is the first ever recipient of the Marie-Josée Prize for New Music. 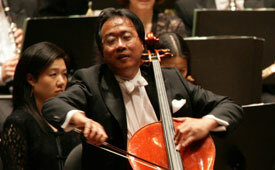 As an added attraction, the concert featured an appearance by international cello star Yo-Yo Ma. Featuring a performance of Renée Fleming, singing Erich Wolfgang Korngold's Ich ging zu ihm from the opera Die Wunder das Heliane. And another Marillion parody, which has nothing to do with Korngold. 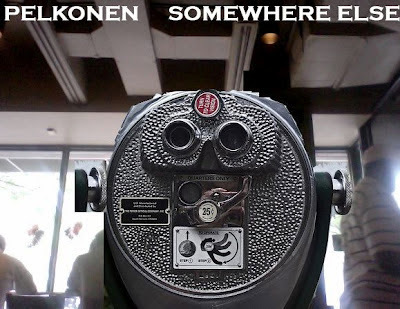 Parody of Marillion's Somewhere Else. Yes that's a Starbuck's. Which is not where I am right now. Parody of the cover of marbles by British prog group Marillion. I didn't have any marbles. 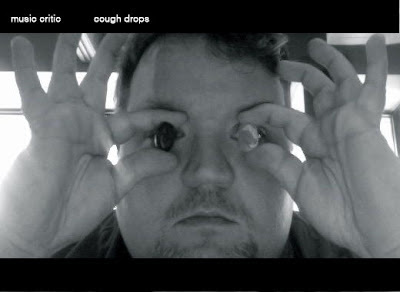 Those are Carnegie Hall Ricola cough drops. Yes I'm still on a (much needed) vacation in parts unknown. After the jump, some nice footage of Renée Fleming singing the Countess in the final scene of Richard Strauss' Capriccio. Ulf Schirmer conducts. Shows what I know. A trip booked on Island Airways landed me somewhere in...Iceland. 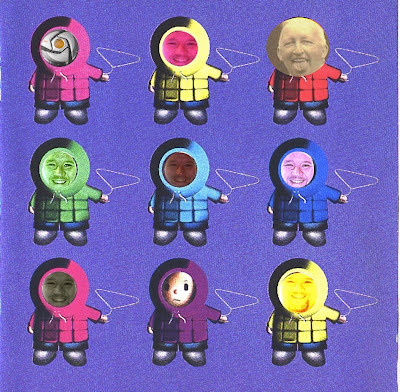 As I fight off polar bears in my Marillion-brand Anorak (pictured) here's some nice music to tide you over as I get a well-deserved break from the hustle and bustle of Gotham. 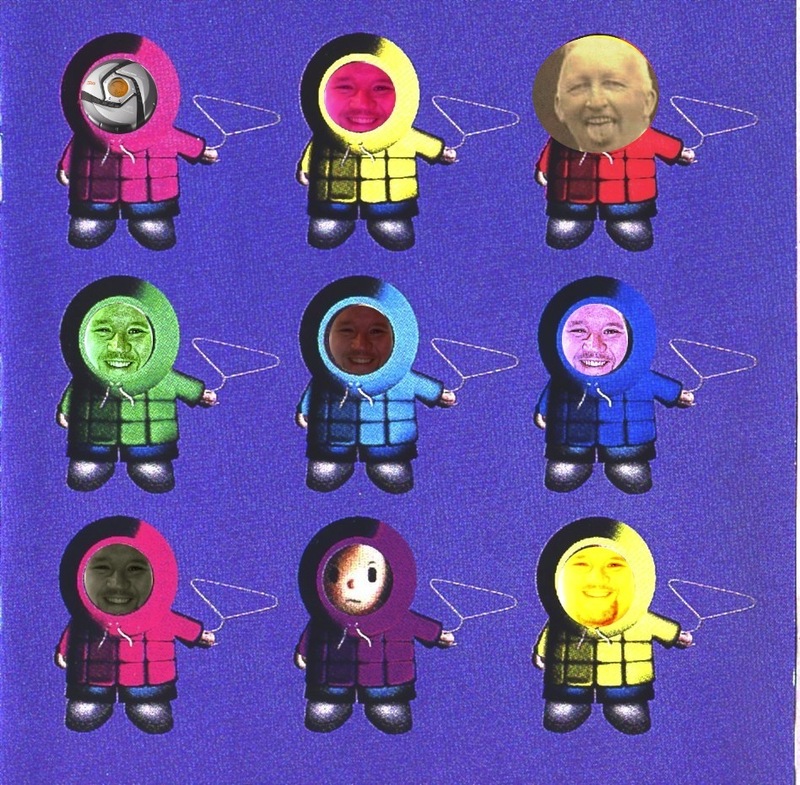 of the 2001 Marillion album Anoraknophobia. Original art by Carl Glover Studio, © Marillion. No, I'm not telling you where I really am. 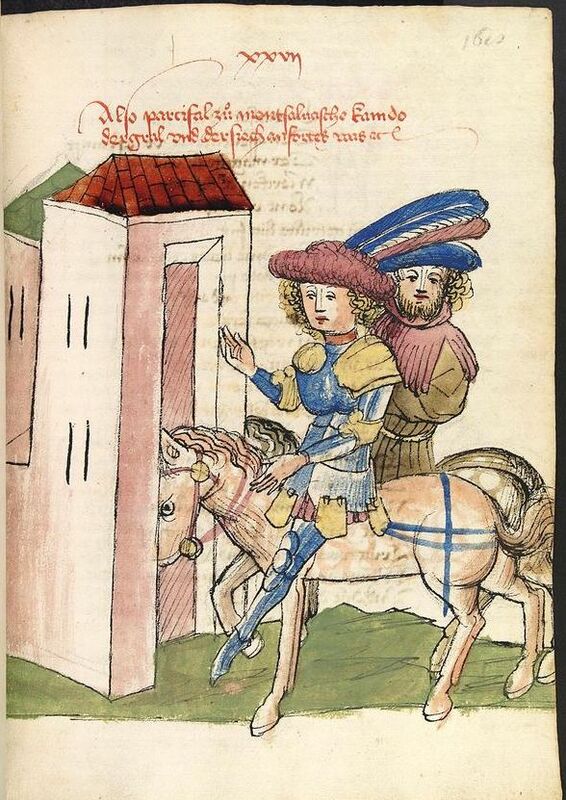 But here's a hint, freundlichen. Marek Janowski's Lohengrin from Berlin. Bad romance: Klaus Florian Vogt and Annette Dasch in Lohengrin. This is the fourth installment in Marek Janowski's ongoing Wagner project: the ambitious plan to make live concert recordings of all ten "canon" Wagner operas with the Berlin Radio Symphony Orchestra. It is also the first commercial CD recording of Lohengrin to star heldentenor Klaus Florian Vogt in the title role. As with his recent Parsifal, Marek Janowski takes an unsentimental approach to this score. His approach works better here, underlining the fact that Lohengrin was Wagner's last work before the composer embarked on the Ring. Tempos are generally fast, with the Prelude to Act I clocking in at a quick 8'31". That momentum is maintained throughout this long opera, and the whole performance comes in 16 minutes shorter than Rudolf Kempe's legendary set for EMI. 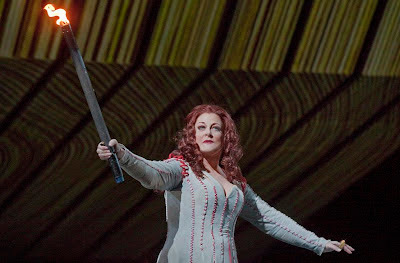 Fire woman: Deborah Voigt torches the Ring. The diva will have surgery tomorrow. Photo by Ken Howard from Götterdämmerung © 2012 The Metropolitan Opera. Deborah Voigt has cancelled her first concerts in Australia due to necessary emergency surgery on her hip. According to a report in Limelight magazine, an Australian entertainment periodical, the singer has to undergo the operation as soon as possible, forcing her to cancel appearances at the Utzon Room of the Sydney Opera House and a concert with the Melbourne Symphony Orchestra. The surgery is scheduled for tomorrow. Bloomberg BusinessWeek report crunches the Met's numbers. "Money fight!" 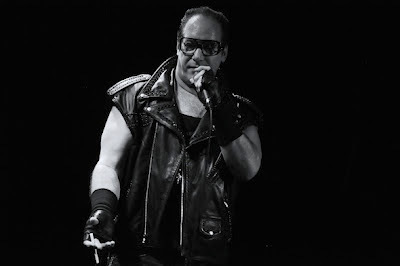 No resemblance to Peter Gelb or James Levine is intended. 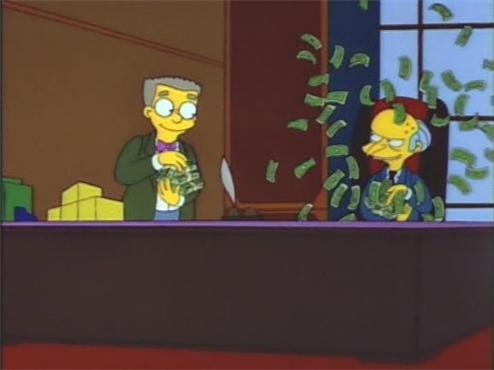 Image from The Simpsons Episode 1F07 The Last Temptation of Homer. © 1993 Gracie Films/20th Century Fox. That's how much music director James Levine made per opera conducted at the Metropolitan Opera in the 2010-2011 season, according to a report on the opera company's income tax return for that year. A report by Philip Boroff on Bloomberg News Business Week got into the financial details of Mr. Levine's compensation, revealing that the company's music director's intake of $2.1 million was an increase from the year before. The conducor led 31 performances, including Wagner's Das Rheingold and Die Walküre and Berg's Wozzeck. By way of comparison, Met general manager Peter Gelb made $1.4 million last season . Mr. Gelb's position included a base salary of $1.25 million, use of a car and driver and occasional first class flights. The Metropolitan Opera offers summer re-runs of its Live in HD series. 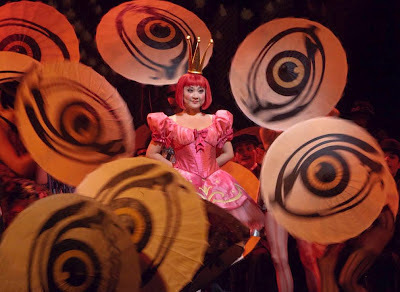 Kathleen Kim in the Met's 2009 Les contes d'Hoffmann. Photo by Ken Howard © 2009 The Metropolitan Opera. Need to get out of the sunlight and into the opera house? Well the Met currently has the Chagalls curtained, but the company is advertising a series of Summer Encores of its Live in HD series. Beethoven, Korngold and Nielsen, with audience participation. Seen (and heard) last week at the New York Philharmonic. 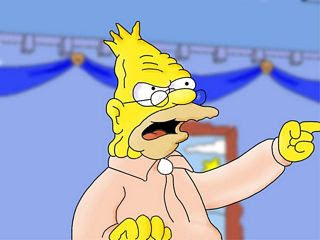 Image from The Simpsons © Gracie Films/20th Century FOX. The New York Philharmonic season ends this month, but music director Alan Gilbert had a strong program selected for Friday afternoon. However, the concert, featuring works by Beethoven, Korngold and Nielsen was home to something else, some of the most intrusive, irritating audience behavior witnessed (by this reporter, anyway) this season. Granted, the concert was not stopped (as happened on January 11th of this year when a phone alarm interrupted Mahler's Ninth Symphony.) However, rude, inconsiderate behavior: a shrieking hearing aid, a repeatedly ringing cell phone, and a loud-mouthed jerk sitting in the seat behind me combined to make the afternoon musicale a stressful experience. No, this won't quite be a straight review. But I'll do my best. An irreverent, operatic celebration of Father's Day. Actor, raconteur, comedian, renaissance man, father of two: Andrew Dice Clay. His appearance on the site is in no way an endorsement of material performed in his act. In the course of writing 28 operas, Giuseppe Verdi worked with many different librettos and literary sources. Yet the theme of fatherhood permeates his work, starting with his very first opera, the all-but-forgotten Oberto. In the spirit of Father's Day, here's a gift guide for the Verdi fathers, tailored to the plots of five of his most famous operas. In which I get all pedantic about Wagner's last opera. 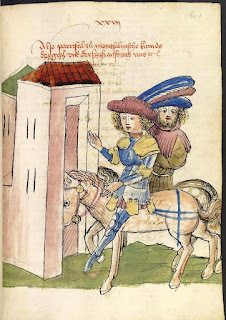 copy of Wolfram von Eschenbach's Parzival. I'm still in the middle of writing the forthcoming Metropolitan Opera Preview for the 2012-2013 season. In the course of perusing the Metropolitan Opera website (mostly for the cast information on coming productions) I came across the following synopsis for Parsifal. 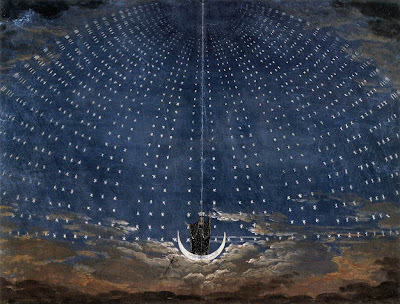 It was on a page for the old (Otto Schenck) production, but I thought I'd take the time to correct a few points--and explain a bit about one of my favorite operas. 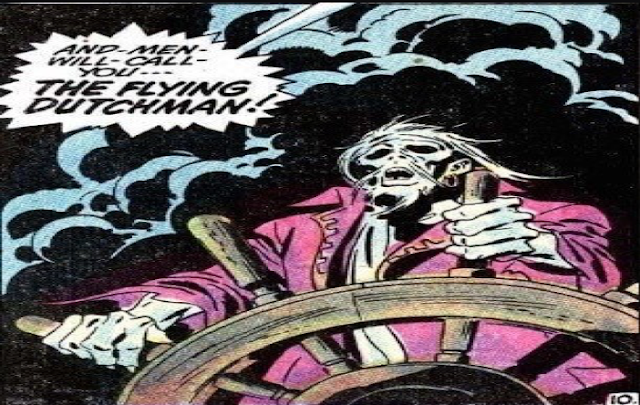 "Much has been written about the mysticism of Wagner’s final music-drama, which is based on German mythology, with many critics disagreeing about the extent to which it can be termed a religious or a theatrical work. 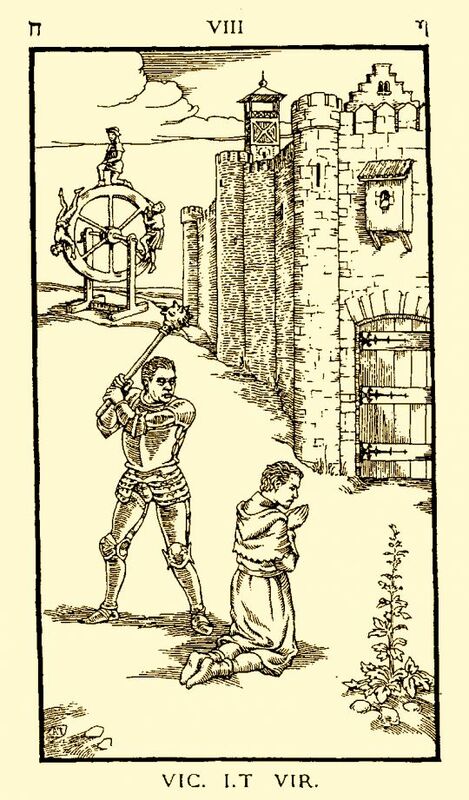 Parsifal, a young and arrogant knight, stumbles upon the home of the Knights of the Grail and discovers much about himself from them and from an encounter with Kundry, an enchantress. After many years he returns to heal a terrible wounded inflicted years before on the ruler of the Kingdom." Sigh. Let's take this point by point, shall we? A return to an old venue and an amazing 2012 finale. 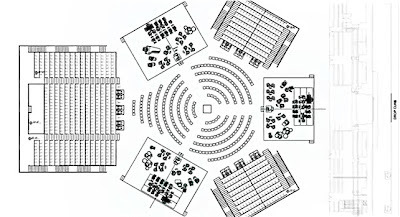 A seating chart for the Philharmonic's upcoming concert at the Park Avenue Armory. All images © 2012 the New York Philharmonic. The New York Philharmonic are ending the 2012 season in grand style with Philharmonic 360, a concert presented in collaboration with the Park Avenue Armory. It will host the orchestra for two performances on June 29 and 30. The concerts feature an unusual program bridging three centuries of music-making, and an unusual venue, the drill hall of the Armory, itself an historic building dedicated in 1880. These concerts mark the orchestra's first performances of Gruppen by German composer and enfant terrible Karlheinz Stockhausen. This work (first played in Gotham by student orchestras) is written for three seperate orchestras, with the audience seated in the middle. Talk about sensory overload. Stockhausen is an important 20th century German composer who was a pioneer in the field of electronic music, creating dense, complicated sound structures that are nonetheless eerily beautiful. 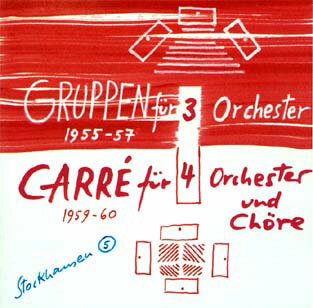 His more unusual compositions include the 7-day opera Licht which includes a string quartet incorporating helicopters. Stockhausen's piece won't include any air support, but it still requires three conductors: music director Alan Gilbert, composer-in-residence Magnus Lindberg, and Matthias Pintscher. Is this a baton I see before me? Conductor Daniele Gatti. Photo © 2011 Sony Classical. This new recording from Sony Classical consists of familiar repertory by Claude Debussy, played by the Orchestre National de France under the baton of their music director, Daniele Gatti. Debussy's major orchestral works are practically required in the catalogue of any conductor aspiring to the major leagues. That means that there are a lot of bad recordings about. Mr. Gatti's effort is a rewarding one, crisply played by an orchestra that sounds very comfortable in the studio environment. This recording has a blossoming, blooming low end, with the deep Tristan-esque throbs of cellos and basses The atmospheric, wide-ranging acoustic centers firmly on the ONF cellos, with occasional comments from warm, rich brass and finely detailed woodwinds. 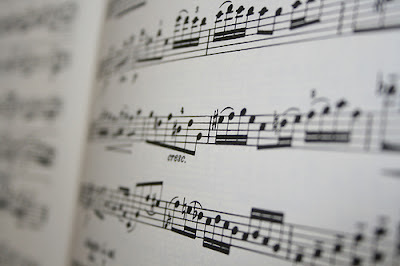 The clarinet playing is a simple pleasure. Matt Haimovitz' Uccello play jazz at Bargemusic. Hot jazz on a cello can have this effect. Art by Evilistical, © the artist. On Sunday afternoon, the Uccello ensemble visited Bargemusic, the floating chamber music venue on a coffee barge tucked under the Brooklyn Bridge. Led by Matt Haimovitz, the the Grammy-nominated unit of "eight cello warriors" brought some unusual repertory: fusion jazz of the Mahavishnu Orchestra alongside more "trad" offerings by Miles Davis, George Gershwin and Billy Strayhorn. Mr. Haimovitz formatted the show somewhere between a chamber performance and a jazz set, taking care to act as emcee and introduce each number before it was played. The concert opened with "Half Nelson," a piece by the Miles Davis nonet that originally appeared on Birth of the Cool. With Dominic Painchaud playing the bass line, Mr. Haimovitz and Leanna Rutt spun out the long, elegaic solos, creating a palpable "big band" sound that echoed the Davis group. Season press release disappears from Metropolitan Opera site. 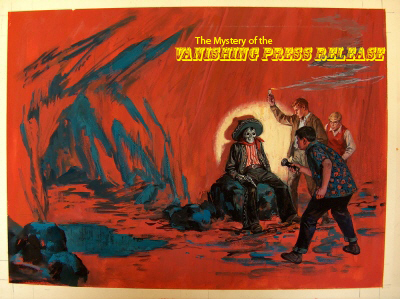 Young detectives meet up with the feared bandit Ramirrez, somewhere in California. The Mystery of the Moaning Cave, © 1968 Random House Books/the artist. As the 2012-13 season approaches, the Metropolitan Opera is notoriously stingy with information. First, the opera company cancelled its traditional press luncheon, opting for a brusque press release. Then, that self-same press release announcing the 2012-2013 season has apparently disappeared from the company's website. Click that link above: you'll get a blank page. Luckily our good friends at Parterre Box were smart enough to post a copy of the season announcement. It is here for your perusal and enjoyment. Here at Superconductor, our hardworking staff of ten (fingers) is putting together this year's Metropolitan Opera Preview, complete with recording recommendations, snarky comments about new productions, and even nice boldface type. With 28 operas on tap, this is the biggest writing job of the year, but it's worth it to keep you opera lovers informed on what's worth seeing at the Met. The New York Philharmonic makes CONTACT! At New York Philharmonic subscription concerts, the performance of new music or works by still-living composers can be an afterthought, wedged between familiar slabs of Brahms and Beethoven. The CONTACT! concerts are different. They take place away from Avery Fisher Hall, and offer nothing but modern music. Saturday night's concert was at Symphony Space. This spring's CONTACT! program, curated by Philharmonic composer-in-residence Magnus Lindberg and led by conductor David Robertson, featured two premieres. opened with a Philharmonic commission from New York's own Elliott Carter: Two Controversies and a Confrontation. Mr. Carter is one of this city's most celebrated composers, and at 103 years old, the dean of modern American music. Chelsea Opera does Madama Butterfly. 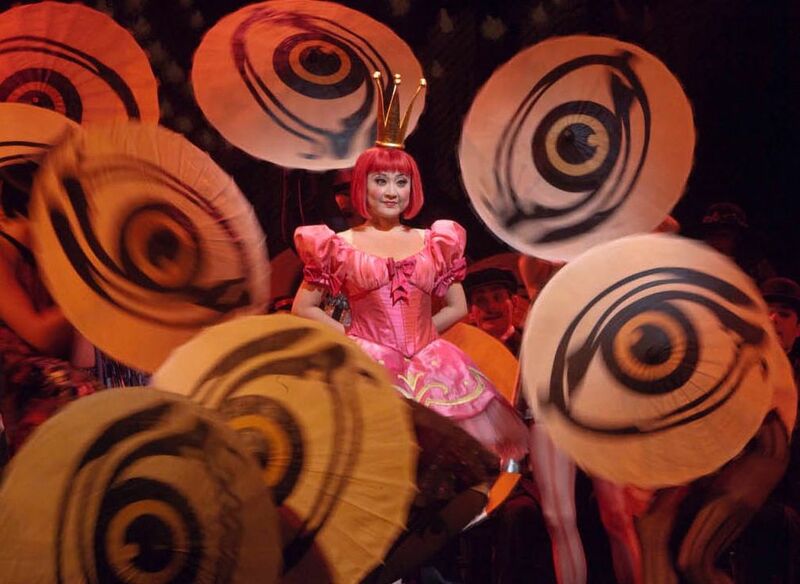 Promotional image for Madama Butterfly at the Chelsea Opera. © 2012 Chelsea Opera. 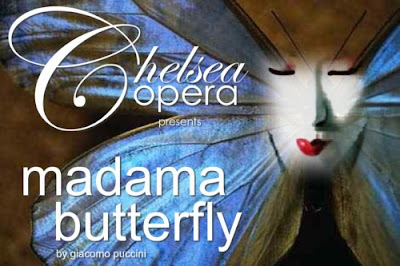 On Friday night, Chelsea Opera unveiled Madama Butterfly, the final opera of its eighth season. The production, mounted at St. Peter's Church in the company's home neighborhood, effectively transformed the church nave into Butterfly's Nagasaki house with a simple, but effective set. Considering that all of Puccini's opera takes place in one location, Butterfly is an ideal project for a small company to tackle. The challenge is finding singers who can make the characters convincing and still sing Puccini's soaring melodic lines with power and finesse. Soprano Christina Rohm showed both of those qualities, charting Butterfly's development from giggling geisha girl to a fully mature, heartbroken woman. Although her voice hardens under pressure, she made use of long experience with the complexities of the character. Ms. Rohm found her groove in the Act I love duet with Pinkerton (Daniel Rodriguez), letting her defenses melt slowly away like layers of Japanese formal dress. 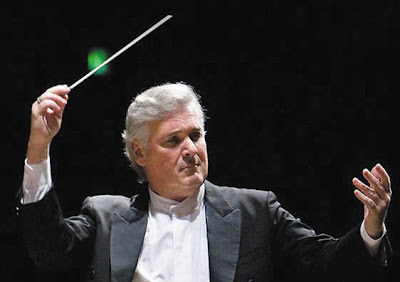 Pinchas Zukerman leads the New York Philharmonic. And he plays violin too: Pinchas Zukerman. Photo from the National Arts Centre. The violinist Pinchas Zukerman played the dual roles of soloist and conductor this week at the New York Philharmonic. For these concerts, Mr. Zukerman chose concert repertory more in keeping with the forthcoming Mostly Mozart festival than the big sounds normally associated with this orchestra. In the world of classical music, the New York Philharmonic looms as a heavyweight ensemble, storming through orchestral showpieces and presenting vast edifices by Mahler and Bruckner. So it was refreshing to hear the skill of its players in a chamber orchestra setting, especially led by a world class soloist. The results, heard on Thursday night, were a charming combination of Bach, Mozart and Stravinsky. 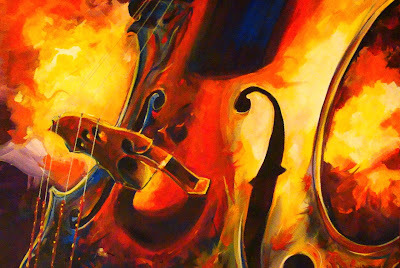 Mr. Zukerman played the solo parts in the Bach Violin Concerto and Mozart's Turkish Concerto, leading the orchestra from the bow of his violin. He then traded bow for baton, leading Stravinsky's Concerto for Orchestra and Mozart's Symphony No. 39. 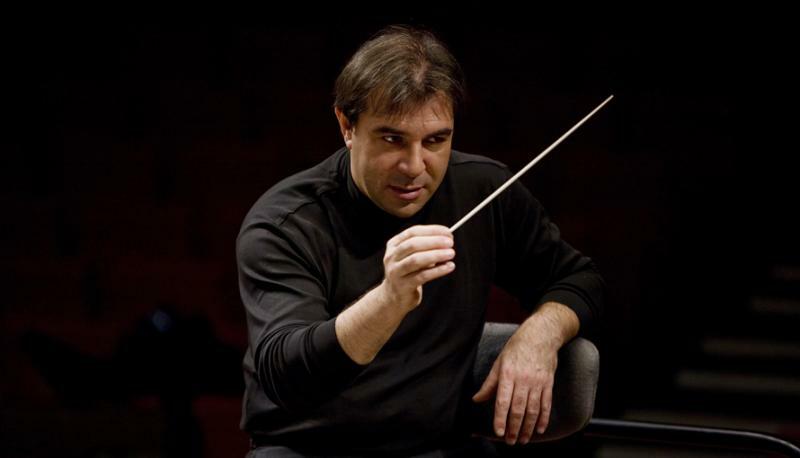 Although the Israeli musician is better known for his solo work, he has over four decades experience as a conductor. A quick note to our loyal readers. Well, a bunch of notes. As it's now June, you might have noticed that offerings on Superconductor have gotten thinner this month. Carnegie Hall is closed for the summer, as is the Metropolitan Opera. As summer marches in, there's much to be happy about. The New York Philharmonic is still going strong, with an exciting slate of concerts this month, culminating in Philharmonic 360, a concert at the Park Avenue Armory celebrating the unlikely confluence of Mozart and Stockhausen. Smaller opera companies are staging...well, smaller opera productions. The summer festival season is almost on us. The Magic Flute at Regina Opera. 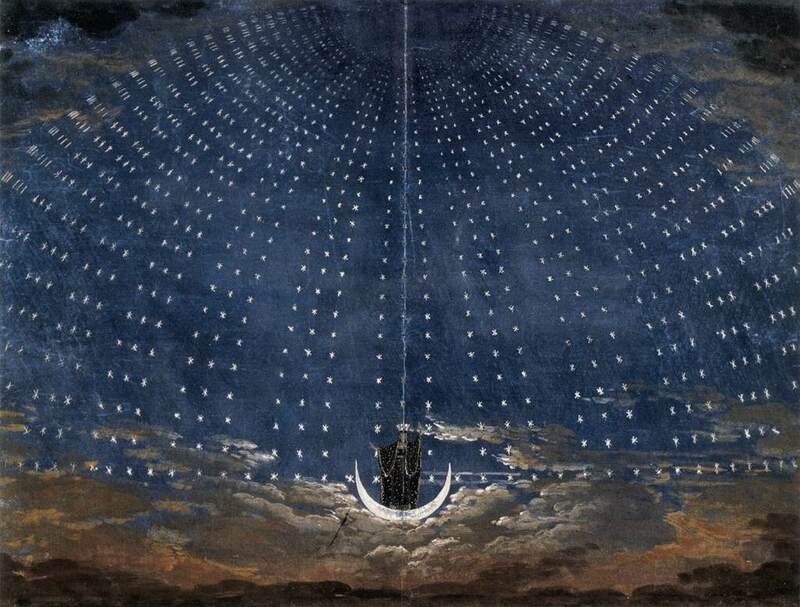 An original set design for Act I of The Magic Flute. For the last 42 years, Brooklyn's Regina Opera has been serving up the best of the repertory to enthusiastic audiences in a church hall in Dyker Heights. On Sunday afternoon, the company gave the second of four performances of Mozart's The Magic Flute, offered here in a sturdy, serviceable English translation. Despite being one of Mozart's most popular operas, the fantastical Flute suffers from over-familiarity and the misperception that the simple story is aimed exclusively at children. The Regina players presented a version that spoke clearly to all generations in the audience, making the opera's two love stories come across as genuine while indulging in the work's mystic pretense. The Philharmonic takes on Carmina Burana. 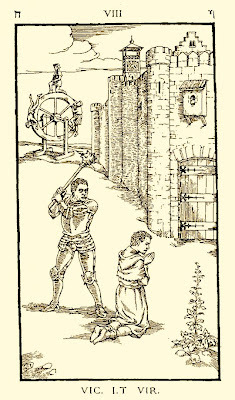 The caption reads: "Virtue lies defeated." The performance of choral music is not the primary mission of the New York Philharmonic. In its long history, the orchestra has taken advantage of skilled choral ensembles and music directors (Leonard Bernstein, Kurt Masur) with a penchant for choral repertory. On Thursday night, the Philharmonic presented the first of three concerts led by Rafael Frühbeck de Burgos, a veteran conductor acclaimed for his interpretations of choral and dramatic music. The program paired Atlantide, the final, unfinished cantata by Manuel de Falla, with Carl Orff's mighty Carmina Burana, an audience favorite. This was the orchestra's first performance of the Orff work since 1995. In the interests of time and authenticity, Mr. Frühbeck chose to present Falla's completed, performable sketches instead of the whole three-act work. Atlantide requires two pianos and lush orchestration for its rich portrait of ocean exploration and the journeys of Christopher Columbus. Juilliard-trained soprano Emalie Savoy sang the pivotal Queen Elizabeth with rage and inner magnetism. However, despite the conductor's best efforts, the disconnected segments of the cantata failed to jell into a dramatic whole. Lang Lang at Carnegie Hall. 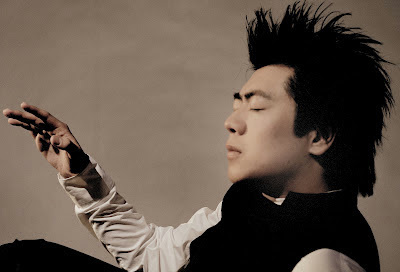 Lang Lang. Photo by Felix Broede for Deutsche Grammophon. 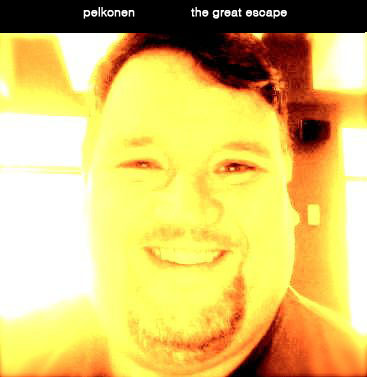 © 2011 Universal Classics. The pianist Lang Lang is a formidable talent. 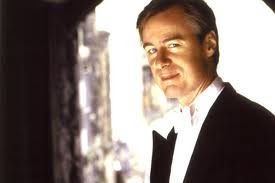 At Tuesday night's recital at Carnegie Hall, the last major subscription concert of the 2012 season, Mr. Lang gave a performance that favored style over musical substance. Mr. Lang has made no secret of his idolization of Franz Liszt, even releasing a Sony collection called My Piano Hero. His playing is not just Lisztian in its prodigious technical ability--he also incorporates a free-form, Romantic approach to tempo and structure. Here, he offered works Bach, Schubert and Chopin. While the written notes were always played, this concert seemed to err, if it can be said, on the side of virtuosity.